The main challenge here is on how to translate the data from your backend to a format that Highcharts will understand. This data may come from a database or an external API, and probably is represented as Python objects (like in a QuerySet), or simply be represented as Python dictionaries or lists. Via an async request using AJAX, returning the data in JSON format. The first option is like a brute force and in many cases the easiest way. The second option requires a slightly complicated setup, but you will also benefit from the page loading speed and from the maintainability of the code. Now we need some data. I thought that it would be fun to play with an existing dataset. The Titanic dataset is pretty famous one, and easy to access. If you are familiar with data mining, data science, or machine learning probably you already know this data set. This dataset is usually used for learning purpose. It’s composed by the list of passengers of the famous RMS Titanic tragedy. We won’t be doing anything smart with it, just querying the database and displaying the data using Highcharts. I won’t dive into deep details about Highcharts. The goal is to understand how to make Django and Highcharts talk. For details about how to do this or that with Highcharts, best thing is to consult the official documentation. The most straightforward way to do it is by writing directly in the template (which is not recommended). 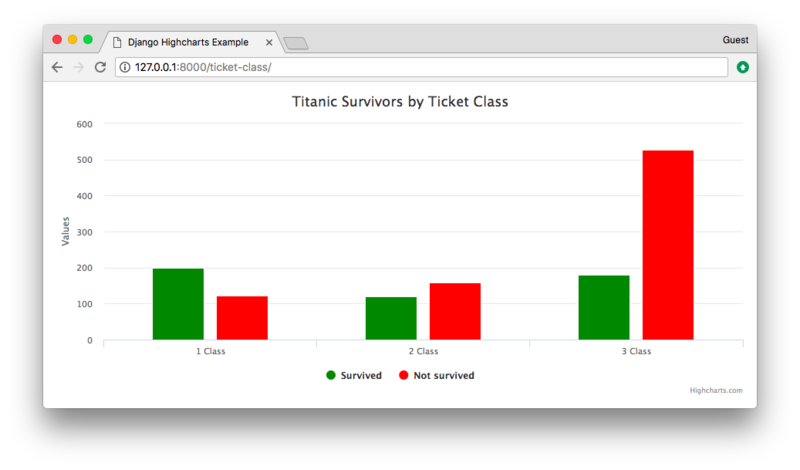 Let’s write an query to display the number of survivors and deaths organized by ticket class. Here’s what we are doing: first run through the queryset and create three separate lists, append the values and do the formatting. After that, use the json module and dump the Python lists into JSON format. The result are Python strings properly formatted as JSON data. We have to use the safe template filter to properly render the categories because Django automatically escape characters like ' and " for safety reason, so we have to instruct Django to trust and render it as it is. The idea here is to render the chart using an asynchronous call, returning a JsonResponse from the server. The json_example URL route is pointing to a regular view, which will render the template which will invoke the chart_data view. This call can be automatic upon page load, or it can be triggered by an action (a button click for example). Here we can see the json_example is nothing special, just returning the json_example.html template, which we are going to explore in a minute. The chart_data is the one doing all the hard work. Here we have the database query and building the chart dictionary. In the end we return the chart data as a JSON object. Here is where the magic happens. The div with id container is where the chart is going to be rendered. Now, observe that I included a custom attribute named data-url. Inside this attribute I stored the path to the view that will be used to load the chart data. Inside the ajax call, we make the request based on the URL provided in the data-url and instruct the ajax request that we are expecting a JSON object in return (defined by the dataType). When the request completes, the JSON response will be inside the data parameter in the success function. Finally, inside the success function, we render the chart using the Highcharts API. 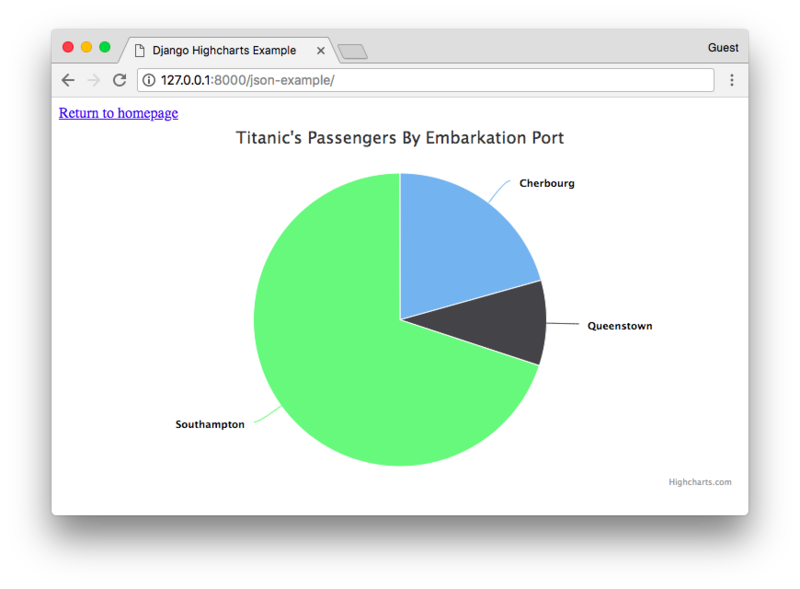 In this tutorial we explored the basics on how to integrate Highcharts.js with Django. 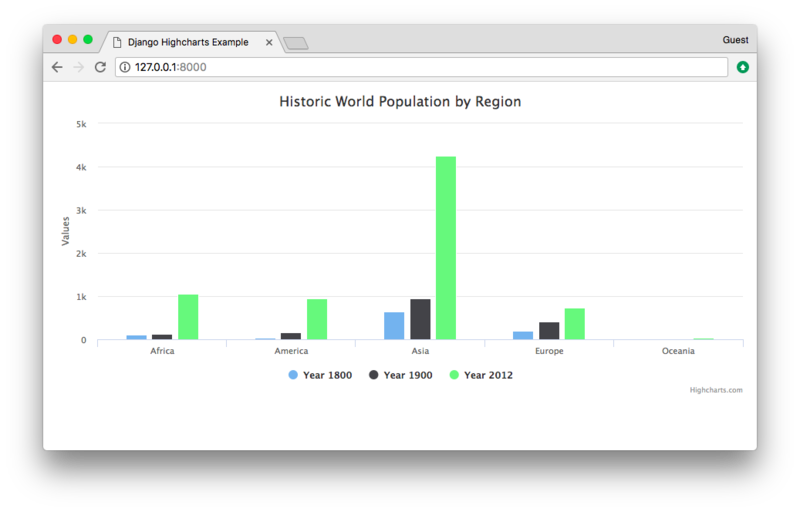 The implementation concepts used in this tutorial can be applied in other charts libraries such as Charts.js. The process should be very similar. Usually when working with charts and data visualization the most challenging part is to squeeze the data in the format required to render the chart. What I usually do is first create a static example hardcoding the data so I can have an idea about the data format. Next, I start creating the QuerySet using in the Python terminal. After I get it right, I finally write the view function. Clone the django-highcharts-example repository on GitHub and implement it.